Plasma cell neoplasms, as the name indicates, are the cancers of the plasma cells. 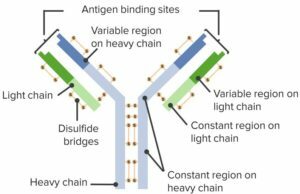 Plasma cells are the antibody-producing, fully differentiated, mature B-cells that have undergone somatic hypermutation and immunoglobulin heavy chain class switching. A plasmacytoma is a solitary, separate, distinct mass of neoplastic plasma cells. It is present either in the bone marrow (medullary) or in various soft tissues (extramedullary). In plasma cell neoplasms, the monoclonal plasma cells proliferate rapidly and form a mass. These cells are large cells with single nucleus and nucleolus and prominent Golgi apparatus, responsible for immunoglobulin production. These cells often have an eccentric nucleus. The neoplastic plasma cells produce monoclonal immunoglobulins, which mean only a single type of immunoglobulin (M-protein) with the same heavy and light chain is produced by the malignant cells. The M-protein builds up in our body and may lead to kidney and widespread tissue damage. The increased neoplastic plasma cells do not fight infections but, ironically, affect normal plasma cells from producing normal immunoglobulins leading to an increased risk of infections. The exact etiology of plasma cell neoplasms is not yet known, however, certain theories have been put forward that may act as the triggering factors, such as chronic antigenic stimulation, chronic infections, chemical and radiation exposure. The World Health Organization (WHO) has classified plasma cell neoplasms into different groups. A simplified version of this classification is a monoclonal gammopathy of unknown significance and plasma cell myelomas like asymptomatic myeloma, nonsecretory myeloma, and plasma cell leukemia. Another classification is plasmacytoma, which can be divided into solitary plasmacytoma of the bone and extramedullary plasmacytoma. Another classification of plasma cell neoplasms is according to their presentation, localized or diffuse. Localized plasma cell neoplasms include plasmacytomas, both solitary plasmacytomas of the bone and extramedullary plasmacytomas of the soft tissue. 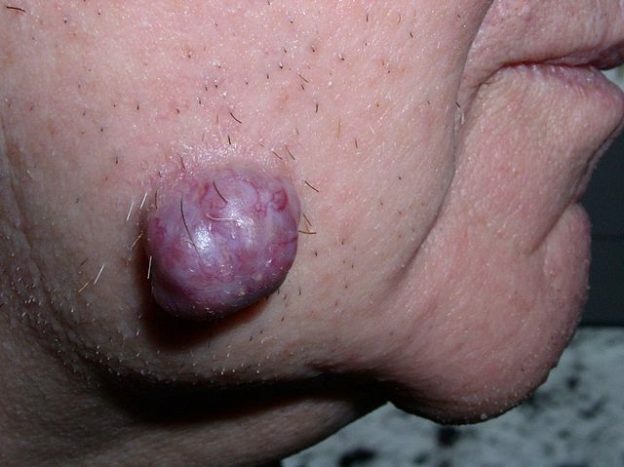 Diffuse lesions include multiple myeloma, plasma cell leukemia, and monoclonal gammopathy of unknown significance. Multiple myeloma is characterized by the malignant proliferation of plasma cells within bone marrow producing a monoclonal immunoglobulin (protein M), mostly composed of IgG (>50% of cases). The rest of cases contain IgA (20%) or light-chain only (15%). It is an aggressive neoplasm that causes extensive bone destruction. The incidence of MM increases with age and the median age of presentation is 68 and 70 years in males and females, respectively. It is twice common in males as compared to females. It accounts for 10% of all hematologic neoplasms. In multiple myeloma, the neoplastic plasma cells produce certain cytokines that stimulate osteoclasts, which results in bone reabsorption and lytic lesions. This leads to bone pain, pathological fractures and hypercalcemia. The bone marrow involvement results in normochromic normocytic anemia or pancytopenia. The clinical presentation of MM is related to the bone destruction, bone marrow involvement, and increased serum paraprotein. The common clinical features are bone pain, weakness, bleeding, anemia, infections, renal failure, fatigue, pathologic fractures, spinal cord compression, neuropathies and hyperviscosity syndrome. Anemia is normocytic and normochromic with low reticulocyte counts. 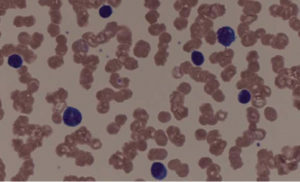 ESR is typically raised and peripheral blood film may show rouleau formation. Hypercalcemia is a common finding. International Myeloma Working Group (IMWG) criteria for the diagnosis of Multiple Myeloma is >10% clonal bone marrow plasma cells or a biopsy-proven bony or extramedullary plasmacytoma. Renal failure: It is largely due to light-chain depositions in the kidney (Bence-Jones protein), renal amyloidosis, hypercalcemia, and hyperuricemia. The raised serum creatinine is present in half of the patients at the time of diagnosis. Infections: The excessive monoclonal immunoglobulins are non-protective and, ironically, they decrease the production of normal protective immunoglobulins. Skeletal survey: For osteolytic lesions. The International Staging System (ISS) is a simple risk assessment algorithm to predict the prognosis of patients with multiple myeloma. It uses two laboratory serum tests, albumin, and beta-2 microglobulin levels. The management of multiple myeloma depends upon the disease stage. The advanced stages are managed with chemotherapy with or without hematopoietic stem cell transplantation (HSCT). Various chemotherapeutic combination regimens have been used and outcomes have been progressively improving. The common therapeutic agents used in MM are thalidomide, melphalan, prednisolone and, more recently, the proteasome inhibitor, bortezomib. Bisphosphonates are used to reduce bone pain and fractures. In addition to the basic chemotherapy, radiotherapy may also be used. The HSCT is efficient in early stages of the disease and prolongs survival. The supportive treatment is provided to treat hypercalcemia (hydration/diuresis), hyperuricemia (hydration/allopurinol), bone pain and fractures (bisphosphonates) and anemia (erythropoietin). These patients should be vaccinated to prevent the infections. This condition is similar to the multiple myeloma, but these patients are asymptomatic and there is no evidence of end-organ damage. No evidence of end-organ damage, namely hypercalcemia, renal insufficiency, anemia (laboratory signs of lytic lesions of bone). MGUS is characterized by increased monoclonal immunoglobulin (M-protein) in the serum or urine, produced by the premalignant monoclonal plasma cells. It is an asymptomatic condition and is often detected incidentally on serum electrophoresis done for other reasons. MGUS is the most common plasma cell neoplasm comprising about two-thirds of all the cases. Its incidence increases with age and is present in around 5% of the population over 70 years. Diagnostic criteria for MGUS are Serum M protein present <30 g/dL and <10% clonal plasma cells on bone marrow aspiration. Also, the absence of end-organ damage such as hypercalcemia, renal insufficiency, anemia, and bone lesions or amyloidosis that can be attributed to the multiple myeloma. Another criterion is no evidence of other B-cell lymphoproliferative disorder. It is important to differentiate MGUS from multiple myeloma because the treatment options are different. The MGUS is a benign condition and treatment is conservative. The patients should be followed over time as there is an increased risk of transformation into multiple myeloma. Plasma cell leukemia is characterized by high blood levels of malignant plasma cells. It is an aggressive rare variant of MM. 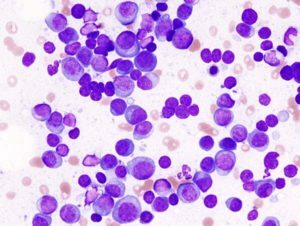 It can occur primary as an initial manifestation, comprising about 2 – 5% of all plasma cell neoplasms, or secondary due to the leukemic transformation of multiple myeloma. The clinical presentation of plasma cell leukemia is similar to the multiple myeloma and other leukemias, such as anemia, infections, bleeding, bone pain, hepatomegaly, splenomegaly, renal dysfunction, hypercalcemia and lytic bone lesions. The significant hepatic involvement or pleural effusions containing malignant plasma cells often suggest the diagnosis of plasma cell leukemia. The diagnosis is initially based upon an evaluation of the complete blood count and peripheral blood smear showing increased monoclonal plasma cells compromising of >20% of peripheral blood white cells or absolute plasma cell count of >2000/mcL. The other features of multiple myeloma will also be present, such as bone marrow aspiration and biopsy revealing >10% monoclonal plasma cells; serum and urine protein electrophoresis showing increased monoclonal immunoglobulins. A plasma cell leukemia diagnostic criteria is the presence of clonal plasma cells in peripheral blood, >2 × 109/L or >20% of leukocytes. The plasma cell leukemia has very poor prognosis. The median survival is less than a year, with one-fourth of patients dying within the first month. The aggressive chemotherapy with VDT-PACE (Velcade [Bortezomib], Dexamethasone, Thalidomide, CisPlatin, Adriamycin [Doxorubicin], Cyclophosphamide, and Etoposide) followed by hematopoietic cell transplantation has been instated without much success. Solitary plasmacytomas of the bone constitute approximately 2 – 5% of all plasma cell neoplasms. They are more common in males and their incidence increases with age. The SBPs have a preference for the axial skeleton, most commonly involving thoracic vertebrae, although any bone can be involved. The clinical presentation of SBPs ranges from asymptomatic incidental finding to pain, pathological fractures, and/or spinal cord compression depending upon the involved bone. Bone marrow aspirate showing <5% of plasma cells. 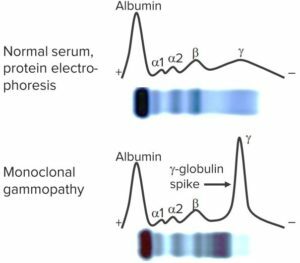 Serum or urine monoclonal proteins should be low or absent. The absence of anemia, hypercalcemia or renal impairment. The local radiation therapy is the recommended treatment for solitary bone plasmacytoma. For peripheral plasmacytomas, not involving the spine, surgical resection is another option in addition to local radiation therapy. The extramedullary plasmacytomas constitute only 3% of all plasma cell neoplasms. Like solitary bone plasmacytomas, they are more common in males and their incidence increases with age. The extramedullary plasmacytomas have a preference for the soft tissues of the head and neck (80%), followed by the gastrointestinal tract. The patients with extramedullary plasmacytoma may be asymptomatic for years or may present with vague features, such as rhinorrhea, sore throat, epistaxis, anorexia, hemoptysis, hoarseness or epigastric fullness. They may be confused with other carcinomas and lymphomas. The local radiation therapy is the recommended treatment for extramedullary plasmacytoma. If the lesion is surgically resectable, then surgery has good long-term results. 1. A 70-year-old female complains of right thigh pain for two months, which is not relieved with the regular analgesics. She has also noticed increased fatigability during the same period. The CBC revealed pancytopenia. Bone marrow examination revealed clusters of plasmablasts, as well as atypical plasma cells that comprise 12% of all nucleated cells. 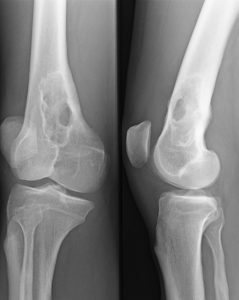 An X-ray revealed multiple lesions in the right femur. What is the most likely diagnosis? 2. A 66-year-old Afro-American man presents to you with a history of multiple fractures after trivial falls. On systemic inquiry, the patient confirms an elevated thirst and severe fatigue even at rest. Laboratory investigations reveal anemia and hypercalcemia. The urine exam reveals raised light chains of immunoglobulin (Bence-Jones protein). What neoplasm might be suspected according to the findings listed above? 3. Which of the following is considered a characteristic for MGUS? Hi, the answers to the review questions are missing from the reference section. could you enter them please? So that I can be certain I’ve answered them correctly.